Madam Zero is an agent with American Intelligence. Okay, we really do not know that for sure. We know she is an agent. We know she is working for the West because she goes up against the Communists in all three adventures we are told about. We know she steps in and saves the lives of American male operatives several times and is very comfortable around them. Still, we cannot say for certain if she is American or not. We assume so based on nothing at all. We cannot say with any conviction whether she works full time for any particular Intelligence group as she certainly never says and no one else in the adventures has a clue. What we do know is she is fairly young (I would guess late 20s), has wavy blonde hair, is quite attractive, and is incredibly intrepid. She must also be one heckuva actress because in the second adventure, she is leading a band of North Korean guerrillas! Wow, how on earth did she get that gig? She is so definitely Caucasian without makeup but in disguise, she fitted right in with the motley crew. Since in the first story she is able to briefly fool a (probably) Soviet agent into thinking she was one of them, we must assume a good grasp of the Russian language and in the second and third stories she is deeply entrenched in North Korean goings-on so an intimate knowledge of that language would be vital. Who knows how many other languages, besides English, she knows. She is also a very good fighter and knows which end of the barrel bullets come out and how to put those projectiles where she wants them. She is decisive and direct as her instantly attacking an American operative to stop him from accidentally spoiling a scam shows. Lastly, we know that Madam Zero has to have been around a while because when the enemy agent in the first story realizes who she is, he is by no means ignorant of her and calls her by name. Too bad we never knew any more about her. 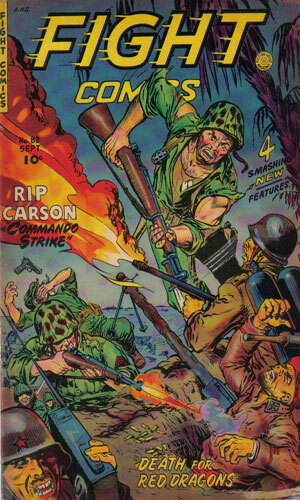 From 1940 to 1954, Fight Comics was a comicbook put out by Fiction House. That publisher had been been around for quite a few years having gotten its start in the early 20s and grown rather large in the pulp business. 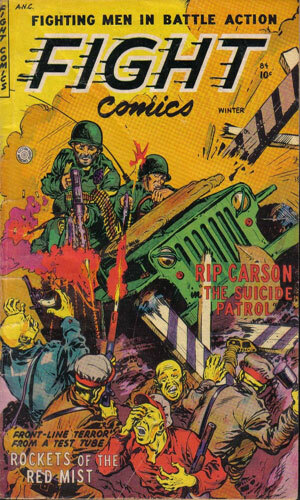 The Great Depression severely hurt the company and they had to shut virtually all their titles but after a short period returned with a batch of comics. Fight Comics did not have any major star in is pages but instead acted as an anthology for several different character series who would stick around for varying times and then go away. Madam Zero was one of the very last to show up, arriving in nearly the last three issues the comic had, #82-#84. The magazine folded two issues later with #86. From Fight Comics #82 - In Paris an American intelligence agent is sent to investigate the disappearance of several scientists. He almost stops another abduction when he is stymied by a mysterious woman. It turns out to be Madame Zero, using the ploy to infiltrate the Communist kidnapping gang. 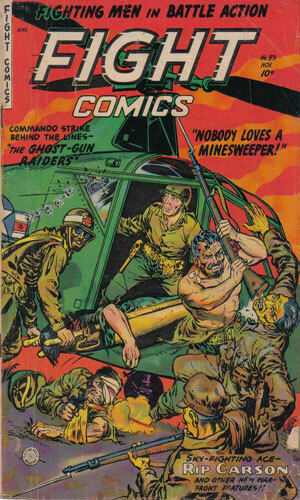 From Fight Comics #83 - American operatives try to sneak into North Korea to purposefully get captured to free prisoners. Already there pretending to be part of the North Korean group is Madam Zero who saves the day. From Fight Comics #84 - During the Korean War, the North Koreans try to use germ warfare to decimate the South. When American operatives go in to stop them, they find Madam Zero is already on the case. There's really no way with only three very short stories to go on whether this was interesting or not. Well, yeah, you could ask yourself if you might read more but I'd answer yes to that about virtually any series 'cause I am me. But for normal people? I have to think that the publisher decided no because the magazine lasted another couple of issues but Madam Zero did not. Trying to make believe that a white woman with blonde hair could be mistaken for a North Korean male is more than a bit much but maybe she really was that good of an actress/makeup artist. And maybe if there had been more stories we might have learned more than she was a blonde white female who had been doing the espionage game for a while. But it was not to be. So there you have it, what little there is.